St. Mary’s Home on "The Hampton Roads Show"
Workers from J.D. 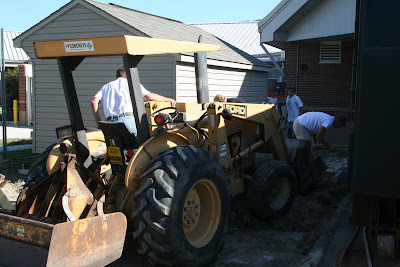 Baker & Sons prepare to pour a concrete slab that will be used for a recycling area at St. Mary’s Home. Recycling is about to get easier at St. Mary’s Home for Disabled Children. While many employees already recycle their newspapers, cans and printer paper, the Home is getting ready to take a much bigger step toward going green. A container for cardboard, bottles, cans, newspapers, etc., will be installed on a new concrete slab on the Home’s grounds. “The new container will make it much easier to do something good for the environment,” said Ron Herrick, heaad of St. Mary’s environmental services department.